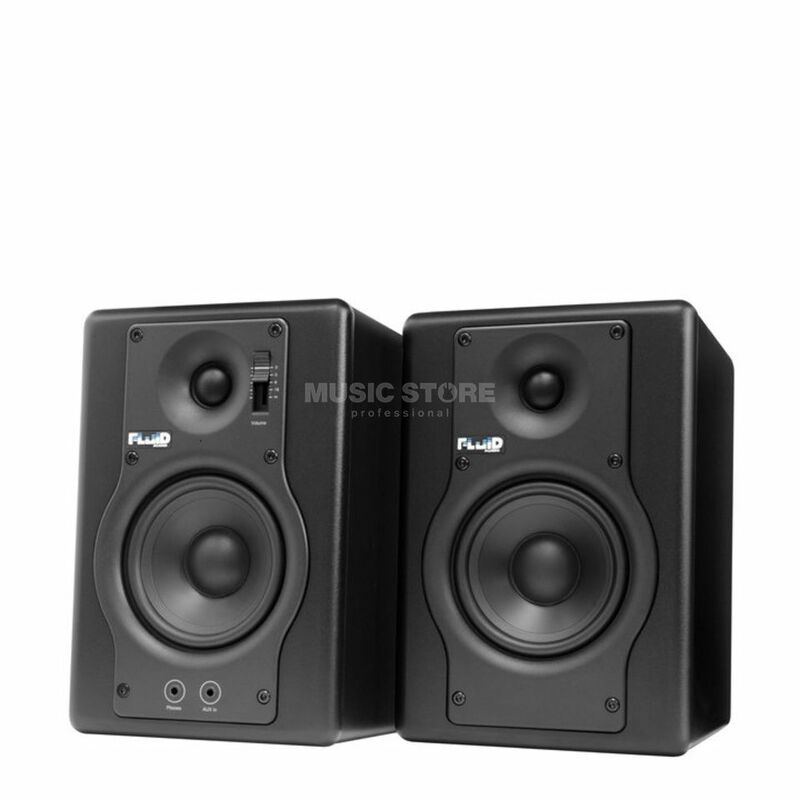 The Fluid Audio F4 Active Studio Monitor is a 2-way active studio monitor, with a 4" speaker, and a 30W output. The Fluid Audio F4 is the perfect entry level near-field monitor for the aspiring musician or seasoned Pro. That's not to say this is not a professional monitor, however. The same amount of time and expertise that was behind our bigger, more expensive speakers was invested in the F4 as well. Great imaging, clear articulate midrange and ample bass that doesn't muddy up the vocals. That is the hallmark of the Fluid Audio sound, and will help you pinpoint exactly what you want to create in your audio landscape. Its compact size allows for flexible placement, whether you're mixing your album on a smaller console or video editing on a small desk - you get professional studio sound quality. Aside from the TRS and RCA inputs, there is also an Aux input on the front baffle as well as a headphone output. As all Fader Series speakers, there is also the convenient fader volume control on the front baffle as well. This monitor is ideal for: Mixing; Video production; and General audio playback. One of the best for the price! I first saw this brand at my local music store and they had it on display with some music playing. I saw the price tag and was surprised. I think these guys are one of the best for the price! They have a very clear sound and they seem very durable. I personally love the volume slider and the phones/aux in ports at the front. Very useful and practical. My suggestion though is that you purchase the 5 inch version as most 4 inch speakers don't have the best bass response and they seem to have Sympathetic resonance within themselves.